From the moment Peek debuted on the market, skeptics have wondered what the future was for a dedicated e-mail and text device in the era of smartphones. But the company has built a very modest, nearly profitable business — 50,000 units sold in two years — with its low-cost messaging handsets and is increasingly selling them to companies in need of connected devices for workers. But while the New York-based start-up has yet to become a well known brand, the company believes its back-end technology, not its current end products, can position it for a break-out year. Peek is expanding to low-cost smartphones and potentially other connected consumer electronics devices. Rather than be swallowed up by smartphones, Peek is betting it could actually ride the same wave of mobility and connectivity to success with a product strategy change. It’s a hefty-sized wager, perhaps even a last ditch effort, but one that CEO Amol Sarva believes can pay off. In a meeting I had with Sarva this week, he told me that in a year from now, the Peek devices and service plans, which currently make up a great majority of the company’s revenue, will become just 20 percent of the business as Peek’s software eventually powers dozens of devices around the world. Sarva said Peek has built its software to work on Qualcomm’s BREW (s qcom) platform and is also outfitted it to work on chips from MediaTek, a fabless semiconductor company. He also said manufacturers in Asia are now poised to use those components and build very low-end smartphones that leverage Peek’s messaging software and cloud service, which will sell in emerging markets such as India, Africa and Latin America. Sarva expects five Peek-powered phones to launch in the next month and 30 phones by this time next year. While emerging markets are slowly embracing smartphones, Sarva said there will be a distinct need for ultra-cheap and simple devices that will sip power and be efficient with network resources, especially in areas that have yet to see 3G networks. He said Peek’s software, which is designed to work on very simple and inexpensive 100 MHz processors, allows manufacturers to build affordable smartphones that could retail for as little as $50 unsubsidized. As we’ve written prior, many manufacturers are looking to the free Google Android (s goog) operating system to build cheap smartphones. But the hardware requirements of Android are still more rigorous than commodity feature phones, so Sarva says there’s an opportunity to ship cheap, but competent, hardware using simpler processors and less expensive components. These could undercut prices of Android devices, while still providing more robust messaging and applications through Peek’s platform. The latest version of the Peek software can handle push e-mail, works in areas with poor or marginal cellular coverage, offers Facebook and Twitter integration, includes location support and has the ability to run light-weight Peektop apps. Even with Sarva’s optimism, the cards are still stacked against Peek in the long run. With more and more cheap Android phones on the way, Peek will be have to prove itself against an army of Google devices. And it’s a question if carriers will embrace Peek when they’re likely looking to sell more profitable smartphones and bigger data plans. Sarva believes there’s also another big opportunity brewing in helping connect consumer electronics devices. He said Peek is talking to major CE brands about including Peek software in everything from photo frames and cameras to tablets, clock radios and MP3 players. He said companies are looking to leverage Peek’s work in connecting to cellular networks as a way to connect their devices. He said by leveraging Peek’s simple software, electronics manufacturers can strike a blow against the increasing threat of smartphones by building in connectivity. “If you’re a camera maker, you can put in 3G and move in the direction of a phone,” he said. The opportunity in what some call the Internet of Things will take longer to materialize, said Sarva, because CE manufacturers take more time to act. But he said that could also be a major part of Peek’s business in the years to come. That doesn’t mean Peek is giving up on its small messaging device, the latest of which the Peek 9 rolled out in September. Sarva said the company has shifted its business away from consumers to corporate customers, who are looking to Peek to equip manual and remote workers with messaging tools. He said dozens of hotels are handing them out to the housekeeping staff to help them report their work progress while trucking companies are giving them to drivers. Some fast food chains like Panda Express and Sonic are also trying out the use of Peeks to track incoming orders. He said even as the smartphone grows in importance, consumers are still holding on to existing devices like laptops and are adopting new ones like tablets. That, Sarva said, shows that people will be carrying multiple devices well into the future. And many service oriented-companies, in particular, may be inclined to rely on cheap messaging devices as essential tools for low-end workers. Peek, which has raised $20 million to date, has always went against the grain, favoring simplicity (sometimes to an extreme) in an increasingly complicated world. This next phase, however, will be very telling for the company. If he’s right, Sarva will prove that the company can find a profitable niche for his software in a connected world. But the pressure will be on as Peek bids to become less of a simpler messaging service and more like the smartphones he’s been competing against. 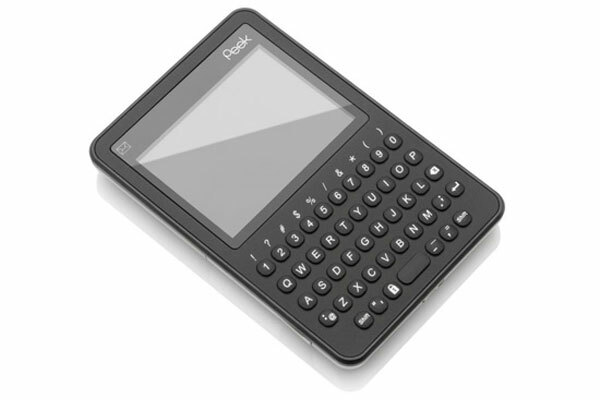 I got in on the “ground floor” of the Peek email device having bought one in April of 2009. The original simple device was perfect for travellers wanting a compact yet easy to type on device for email. The great advantage of the Peek was it’s ability to “collect” emails without the user having to log on to the internet. In other words you simply power on the device and it does the work.. all you have to do is read your emails without passwords etc. Unfortunately, Peek under Amol Sarva’s leadership has chosen dishonest and shady buisiness practices. For example: The original Peek devices all went dead last October. Customers were promised new Peeks for $1 plus shipping and handling and 15 days service credit. The replacement devices were slow in coming. Some customers waited 2 months only to find out the new devices were in-operable. All the while Peek continued to charge customers they knew had no service and when they rightly complained, Peek shut off it’s phone system, and ignored customer emails for months. Peek even shut it’s help forum down on GetPeek.com, which was the only remaining contact option. Customers had to cancel their credit cards to stop the fraudelent charges being made to their accounts by Peek for service they did not recieve. People still, as of 12/20/10 have not recieved credit for the service they never recieved from Peek. I stand by the original product. The Peek for 9.99 a month, basic email and text, was a great product. The dishonest, shady, management practices of the Peek company are a deal breaker for me. Would you trust a company that charged your credit card even after they knew your device had no connection to the email server? After reading this article I cannot help but feel like a tool of the Peek company. They used the customers to develope their product and now we are cast off and ignored while they still charge us monthly fees. Amol Sarva might be a bright tech guy but he has no head for buisiness judging by the way he handles customer service at Peek. LINUX and/or ANDROID will definitely be the future of mobile OS besides WINDOWS MOBILE and SYMBIAN. And Amol is aiming on Nucleus, what is really be used in a lot of low cost phones in the emerging markets, as they have based their PEEK exactly on such kind of under powered hardware. In those markets, where customers have no additional money at all to give away for additional services. And when it’s coming to PEEK’s latest software, any of my smartphones is able to collect pull or push email on the same location where the PEEK doesn’t have any network connection anymore. And I’m not the only client who was noticing that. Well, don’t get me wrong, I like Amol’s vision. But I don’t like how they operate their business since they have pushed the PEEK9 into the market, what is nothing more than a big bluff to collect more money from the private customers, which they have abandoned … And I doubt that leasing their backend to TELCOs will present them a stable income. 3G/4G and WiFi/WiMAX Broadband access makes proprietary message delivery solutions like PEEK’s backend less and less necessary and somehow already obsolete. I hope they are thinking about what their business will be 5 years from now, because as component prices drop, Android will be on cheaper and cheaper devices. Next year we’ll see it on $100 unlocked phones, and a few years after that it wil be $20 phones. The future is all phones = smartphones. For his company’s sake, I hope he knows that, and starts preparing for that future early on. I like Sarva’s attitude. But, please! Stick a fork in Peek they are done. Android will eat their lunch unless they can deliver a smartphone for less than $15 as this is the greatest barrier to entry in emerging markets for full scale adoption of “good smart” mobile devices.